Successfully Defended Thousands of DWI Cases Throughout the State. If you've been arrested for a New Jersey DWI it's important that you hire an experienced attorney who understands DWI law and will aggressively fight for your rights. The lawyers of Levow DWI Law are a group of three DWI trial attorneys dedicated to DWI / DUI defense. We know the nuances of the practice and the case law, the judges and the prosecutors, and most importantly we know how to deal with all of the circumstances that arise with a DWI arrest in New Jersey. Our practice area is the entire state of New Jersey. North and south, east and west, we are known by the judges and prosecutors in all 21 New Jersey counties and 566 localities as aggressive DWI attorneys who leave no stone unturned when defending our clients. We are trained and qualified in field sobriety testing by the same government organization that trains the police, the National Highway Traffic Safety Administration. We are going to know if something was done improperly with your field sobriety testing. That may be one way to weaken the state's case against you. All of our lawyers are certified in the operation and maintenance of the breath testing machine currently used in New Jersey, the Draeger Alcotest® 7110. We have advanced training in breath and blood testing, and will thoroughly evaluate your case to determine your best defense. Clients don't hire us to hold their hands and plead them guilty - clients hire us to aggressively fight the charges against them and to give them the best possible advice on how to proceed in their situation. There are many challenges that can be made to a NJ DWI charge. Please call us today for a free case evaluation and to discuss your case. 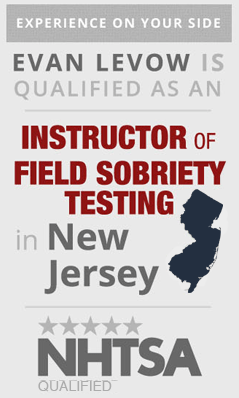 All three of the New Jersey DWI lawyers at Levow DWI Law are trained and qualified in field sobriety testing by the same agency that trains the police, the National Highway Traffic Safety Administration. Additionally, Evan Levow is one of only five attorneys in the state, certified as an instructor in field sobriety testing, which means he is qualified to teach the police how to administer the field exercises you took road-side. The reason we underwent this training is to know the “testing” as well as or better than the officers. This way, we can analyze the exercises you performed, and determine whether the officer administered the testing correctly. If not, the reliability and validity of the testing is compromised. This may be one way to weaken the state’s case against you. Our New Jersey DWI lawyers have advanced training in Blood and Urine Testing, as well as the DRE – Drug Recognition Evaluation course. We have studied with top forensic scientists across the country, attending comprehensive seminars, in order to help us identify and evaluate blood and urine testing issues in your case. Along with other experts we might recommend to you, we determine whether the blood draw was done properly, whether the sample was stored properly, and whether proper testing procedures were applied in order to obtain an allegedly scientifically reliable result. We were the first law firm in New Jersey to own both the original breath testing machine, the Draeger® Breathalyzer 900, and the newer Draeger Alcotest® 7110 MKIII-C, which is the breath testing machine currently in use in New Jersey. All of our lawyers have undergone the Draeger factory certification training on the Alcotest®. Levow DWI Law also owns the Draeger® Breathalyzer 900, which was discontinued between 2005 and 2009 in favor of the Alcotest. 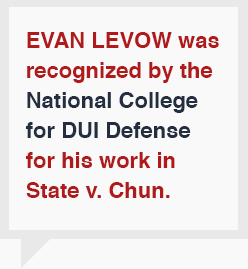 Evan Levow represented the lead defendant in State v. Chun, the most important DWI case in New Jersey history. Chun set the standard for DWI defense and prosecution in New Jersey and has also affected national protocol. We are committed to applying all of our knowledge on breath testing to your case, based on our years of breath testing litigation experience, as well as the multiple seminars that we attend every year on DWI defense. We will assess whether you were properly observed by the arresting and testing officers prior to the breath testing. We will determine whether your medical history, employment or hobbies could possibly effect whether the sample you gave was accurately read by the breath testing machine. We know the problems with the Alcotest machine and its possible errors. If we can show that the machine was not working properly or not properly calibrated or that the person operating the machine was not qualified or certified, we can attempt to get the breath results thrown out. We leave no stone unturned when defending our clients. 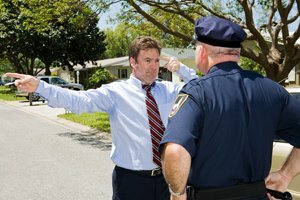 Our clients receive personal attention, support and a well designed defense based on the unique circumstances surrounding their arrest. The attorneys at Levow DWI Law are not satisfied until every possible avenue of defense has been exhausted. Through thorough investigation, negotiation, and when necessary, litigation, we do everything possible to produce a favorable result for our clients. Clients do not hire us to walk them into court and plead them guilty. Clients hire us to aggressively fight the charges against them. Although no lawyer can guarantee results, we can guarantee that we won’t stop fighting for you until you tell us to. We go through every aspect of your case to ensure the proper discovery is obtained and the proper motions filed. There are motions to suppress evidence if your constitutional rights were violated during the stop, and there are motions to limit or dismiss evidence under certain circumstances. Please call us today for a free consultation. We want to help. At Levow DWI Law we understand that above all this case is about you and your life, your freedom, driver’s license and perhaps even your employment. We are committed to getting our clients the best possible results under the circumstances. When you hire Levow DWI Law you get the backing of a skilled and passionate legal team. Evan Levow is well known throughout New Jersey and the country for his innovative and aggressive DWI defense approach. He is often referred to as the DWI lawyer’s lawyer and is frequently sought out by other DWI attorneys to discuss strategies on how to defend their own clients. Evan Levow is a frequent lecturer on national panels and at seminars where he teaches the latest DWI defense strategies and the science behind the defense. 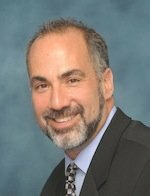 He is responsible for major victories in breath test and blood testing litigation that have brought about positive change for DWI / DUI defendants locally and nationally. Mr. Levow represented the defendants in State v. Kent and State v. Renshaw, the most significant recent blood testing cases in New Jersey. Evan’s work changed how the state is required to present witnesses, where by the state is now required to produce live testimony to establish how blood was drawn and tested. Evan’s work allowed for the protection of our constitutional right to confront witnesses. New Jersey driving while intoxicated cases are prosecuted in one of two ways - driving under the influence of alcohol , which focuses on whether the driver was impaired by alcohol, or having a blood alcohol content (BAC) of .08 percent or greater, also known as a “per se” charge. New Jersey drunk driving law is unusual in several ways – first, unlike most other states, New Jersey doesn’t give drivers accused of drunk driving the right to a jury trial. Motorists accused of driving while intoxicated are entitled to a court trial only – where a judge, not a jury, decides the driver’s guilt or innocence. There are advantages and disadvantages to this system. An experienced DWI defense lawyer at Levow DWI Law can explain how a court trial rather than a jury trial may affect the outcome of your DWI case. Fortunately, drivers who are found guilty of New Jersey DWI / DUI by a judge during a court trial are entitled to what is known as a “de novo” appeal. In a de novo appeal of a New Jersey drunk driving conviction, a second judge, a county level Superior Court judge, will review the trial transcripts and listen to arguments from attorneys on both sides. It’s essentially a second chance for motorists convicted in a municipal court of drinking and driving in New Jersey. Drivers with more than one prior DWI / DUI conviction face special concerns with the enhanced penalties associated with second or greater convictions. Third or greater alleged offenders face mandatory 180 days in jail. In all of these cases, we will evaluate not only the current allegations against the driver, but also any prior convictions to determine whether procedures and protocols were followed. If there is an opportunity to re-open prior convictions and reduce the penalty exposure in the current matter, we will advise you of this invaluable information, and go back to the “old” courts to try to obtain relief in the prior matters. Evan Levow has helped many individuals address prior DWI convictions and obtain favorable results for the current pending matter. Many drivers accused of a DWI are understandably nervous about facing their charges, but should know that it’s entirely possible to beat a drunk driving charge. It is not a foregone conclusion you will be convicted or that your penalty will be automatic. There are many ways to challenge a New Jersey DWI arrest. The DWI attorneys at Levow DWI Law stand ready to help. Please call us today for a free case evaluation and so we can get started on your defense. Video Evidence in New Jersey DWI Cases In prosecutions for alleged driving while intoxicated (DWI) in New Jersey, the state must prove each element of the offense beyond a reasonable doubt. Evan Levow was recently named to the 2019 New Jersey Super Lawyer list - for the 10th year in a row! Congratulations Evan on your consistent and outstanding results, and noteworthy dedication to your clients! Evan Levow has been recognized on the 2019 Best Lawyers in America list - for the 12th year in a row! Evan has been selected for this prestigious accolade. EVAN LEVOW HAS BEEN NAMED THE FIRST PRESIDENT OF THE NATIONAL DUI BAR ASSOCIATION, “DUI DEFENSE LAWYERS ASSOCIATION”(DUIDLA). CONGRATULATIONS TO EVAN ON THIS DISTINGUISHED APPOINTMENT! 0.30% BLOOD ALCOHOL CASE DISMISSED. NATIONAL TRIAL LAWYERS Appoints Evan Levow for the top 100 Trial Lawyer list!